Alivio Medical Center offers healthy pregnancy services, prenatal classes and annual gynecological exams. Our OB/GYN and midwifery team consists of bilingual and bicultural obstetrician/gynecologists and nurse midwives. Our board-certified OB/GYN providers believe in making our patients feel comfortable and respected. We will listen to your concerns and answer your questions clearly. Whether you are thinking about getting pregnant, expecting a baby or need gynecological care, our team of doctors provides a wide range of services. We have diabetic nutrition counseling, ultrasound and laboratory services on-site. 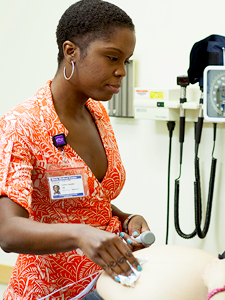 Certified nurse midwives are healthcare providers who focus on the physical and psychological well-being of the mother by providing prenatal care and education, continuous hands-on assistance during labor and delivery and postpartum support. The education and knowledge base that mothers receive by the midwives enables them to feel more in control of their bodies and the health of the babies through natural childbirth. The goal is for mothers to experience a more fulfilling and beautiful delivery. Midwives work together with doctors to offer the best personalized care. Alivio Medical Center offers free, confidential pregnancy tests during clinic hours at each of our locations. Pregnancy tests are available on a walk-in basis, without the need for an appointment. A case manager is available to provide you with results immediately, along with any referrals to social services and medical care that you may need. In addition to providing free pregnancy testing, Alivio provides assistance with applying for public insurance coverage under Maternal Presumptive Eligibility. Alivio Medical Center provides care both prenatal and perinatal care (before and immediately after your baby is born) in a Spanish-speaking and culturally-sensitive environment. Alivio’s OB/GYN and midwifery team delivers babies at our partner hospitals: Mercy Hospital and Medical Center, MacNeal Hospital, and Rush University Medical Center. Expecting a baby is a life-changing experience. Prenatal classes will help you learn what to expect during labor, birth and early parenthood. Being prepared can help you feel more confident and less anxious during this special time. Classes are available to all Alivio patients. Case management is a program that helps low-income, pregnant women and babies (up to one-year old) obtain services needed for both mother and child to stay healthy. We help you find community resources such as medical care, food pantries, support against domestic violence, childcare, transportation, mental health services, substance abuse treatment, shelter and more.